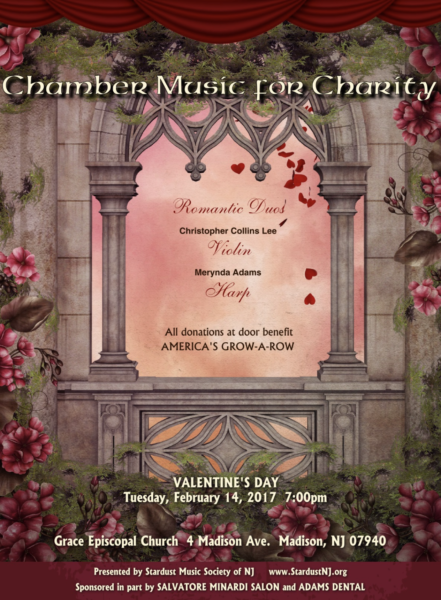 If you aren't sure what you should do for Valentine's Day yet... and are looking for something a little different... add some romantic chamber music to your plans. Thank you to Grace Episcopal Church for hosting this concert; Stardust Music Society and their sponsors; as well as corporate sponsors, Adams Dental and Salvatore Minardi Salon for helping to make this event possible. Please consider donating to Stardust Music Society to further the Chamber Music for Charity concert series. www.StardustNJ.org Hope to see you on the 14th!